This picture is a few seasons old. But it was Ethan's birthday yesterday, so I dug it out. Fortunately, while sour cream will go bad and spoil after a few weeks, pictures do not. This meal is so old but I've been saving it. Appropriately analogous to my favorite holiday dedicated to stuffing our faces, this picture documents a meal for only two people. Even without the tryptophan, the turkey's secret ingredient, Ethan and I were sleepy, and we didn't even finish it. Happy Thanksgiving from Burrito Blog! I first mentioned this a long time ago, and I'm sorry for the lapse in blogging and for keeping you all waiting. 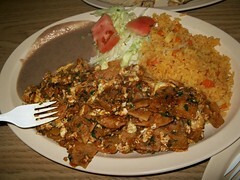 It seems appropriate to finally share this incredible meal with you after a weekend of craving chilaquiles. It's fried corn tortillas with eggs, salsa, and chipotle sauce served with a side of rice and low viscosity refried beans. It was amazing. Ethan and I both ditched our burritos and went after the chilaquiles. We were merciless in our pursuit of total consumption. Was it the ultimate hangover cure? 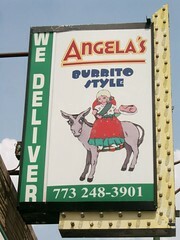 Angela's Burrito Style does not lie. 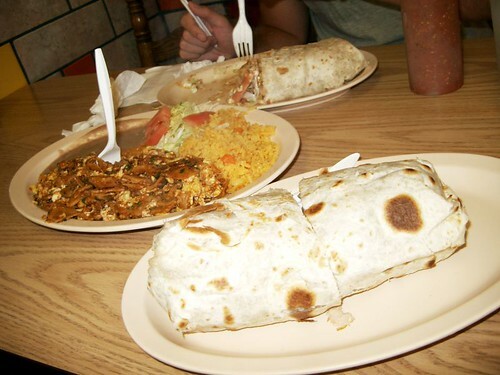 This Angela's Burrito Style meal was rated: 8.9. Setting: Chicago. Sunday Morning. Here's a hint about how the last night went - Ethan was chatting up a cab driver last night about Ghanaian politics. 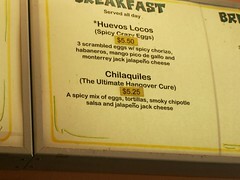 We were hurting the next morning, so when the menu at Angela's described one item as, "The Ultimate Hangover Cure" we had to try it. Review to follow. 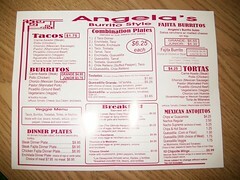 The Mexican food highlight of my Chicago vacation, Ethan took me to Angela's one Sunday morning after a long night of drinking. It's located on North Clark Street, (Map) which is to say I had no idea where it was. While this wasn't his favorite spot, the other was too far away. Yeah, Chicago is huge. Click on the menu for a readable size.